One of the ironies of postmodern media is how cliche its preoccupation with the production of art has become; what began as a rebellion against convention has become convention itself, so much so that self-conscious programming often smacks as, well, lazy, except to the most otaku among us. Even more ironically, Mangirl! bypasses this pitfall completely by not really being about Manga. A couple facts and figures aside, this is far more a show about cute characters being cute than it is about the production of Manga, although that, of course, could change with more airtime. The girls are themselves unremarkable stock characters, at least at first glance. Therefore, if the subgenre I'll, for the sake of convenience, call "moe girls doing random activity" is your fix, then this show may provide some balm for that open wound. If you're interested in Manga, then it's by and large a non-entity. As an extremely short (3,5 min episodes) and simplistic comedy, this anime won't deliver a complex story or amaze you with production values. Still, I would argue that it doesn't deserve most of the harsh criticism it received. Similarly to other Earth Star shows, Mangirl! offers good humour, catchy opening theme and, above all, produces a positive, lighthearted mood that makes watching it simply a pleasant and relaxing experience. It's probably not that interesting if you look at separate episodes, but is really enjoyable when you marathon (although in this case it's more like a middle-distance run) through the whole series on a lazy evening. It made me smile and laugh just as I expected, never leaving me bored or disappointed. 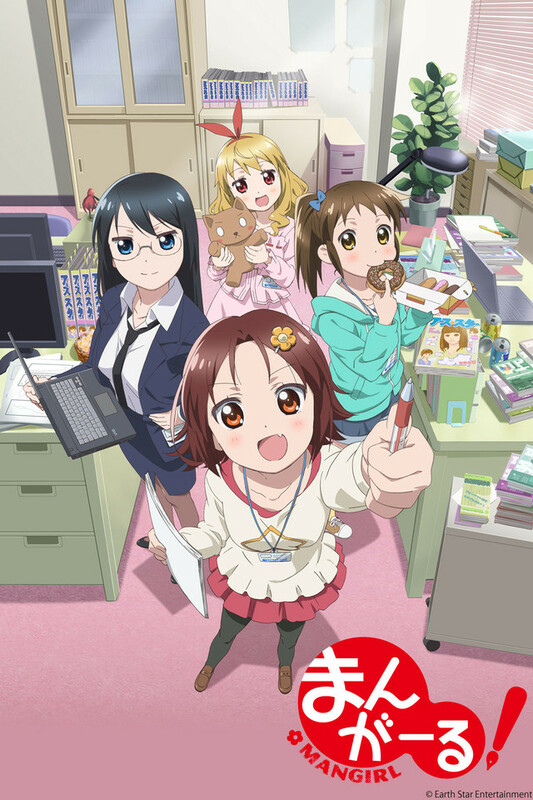 Some could say it tries too hard to be cute, but I wasn't really bothered by it, as it never went into truly cringy areas and, especially after the first two episodes, delivered pretty consistent gags and amusing dialogues, really not depending on any "moe" factor. While Mangirl! surely isn't a masterpiece and didn't invent anything incredibly fresh, I still think it's heavily underrated - the amusing distraction is all it really tries to be and I think it absolutely succeeds in this respect. If you approach it with open mind and basic understanding of the formula, you should really have a good time with it. I liked watching this show, even though it was really short. The characters where one dimensional but how much can you develop character in a show that is about 3 minutes and is only 13 episodes. The last episode does having you LOL a bit about the concept. All in all not a waste of time but, a fun anime when you want something light. Charming but ultimately forgettable cast. Maybe it's cuz the show's over so fast, you don't have a chance to really get invested. That being said, seeing the comedic journey from idea to publication was a fun premise for this show. I think if it had been given full length or a second season, I could have come to appreciate it a good bit more. Eh... You'll be done with it before you have time to realize you wasted your time. Usually the problems with an animated series wind up being one of filler content: attempts at stretching out 10 minutes of content into a 30 minute episode result in lots of padding, especially in slice-of-life shows like this. Mangirl! has the opposite problem: everything is so condensed that the series never really gives the viewer any time to breathe. I don't think there's even more than two seconds of consecutive silence between any story beat in this series. The thing is, while I could see how you could build a series out of shorts like this, it's a very constrained form of writing. Imagine if we forced the writer to convey all of the story through Twitter; all of the subplots or characterization that you would expect have to be stripped out just to fit. The result is a series that is paced very oddly. Like, there is character development going on here. But there's barely any room for it. I didn't even notice any character development until episode 7... which, if this was a normal TV series, would actually be episode 2. Yes, the story goes as fast as the shorts need it to, but you learn about the characters in question as fast as you would in a normal TV show. The result is that the cast is very homogenous - nothing stands out and I can barely tell them apart. Instead this flows much more like a series of vignettes demonstrating possibilities that could and often do happen when producing a comic book serial. And that's actually not the worst thing that they could have made with the concept. But it's a very deeply flawed product that I cannot recommend wholeheartedly. Maybe if they try this concept again as a half-cour series, spread out over 30 minutes, we could have a much better show. They should make a show about this. The series is cute with a certain charm. Given the 3 minute episode you get a simple telling of a story, in this case of a group of girls who decide to make their own manga magazine. I think the shortened episodes forced the story to be told quickly. Although I am sure this story could have been done better in a regular length episode format, allowing for more details, and character development, it is thoroughly enjoyable in the short format. Given the short episode time, it is not a huge investment to watch the entire series (which will take a bit under an hour). It is definitely worth the watch. The show is decent but I wish it was a bit longer but it would probably would drag on if it went on longer.The characters are a bit underdeveloped and kind of bland, the magazine was also boring and mentioned heavily but never really expanded upon. The show is about girls trying to follow their dream of making a popular manga magazine. Well, it seems to be more Hanna's dream but, its still a cute story. It does have some stuff in it that seems to hint that it may used for 1 or 2 tips about comics but, its still a great 3-4 minute show!